fall seems to be making an early arrival this year. vancouver had an unprecedented hot summer so it seems a little cruel that it will be over soon. not that fall doesn't have it's charms but rain is not one of them. i have spent most of my life on the wet west coast but i honestly never wore proper footwear or carried an umbrella until last year. i also swore i would never wear a hooded waterproof anorak but succumbed to practicality several years ago. motherhood can really squash one's fashion aspirations. while i am sure there are cool coats/boots/umbrellas to be found, my budget doesn't allow for much in the way of luxury items. quite frankly, i am not much for wearing a big logo anyway. 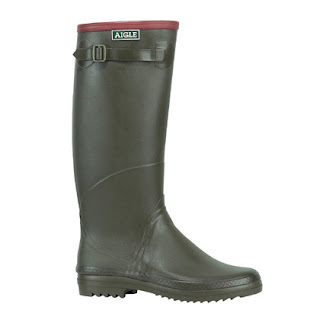 so i am on the search for new rainboots/wellies/gumboots/hipwaders. i am a huge fan of aigle boots. when i lived in japan i had a lovely pair - lost to a bonfire - sad, sad story. now to find the perfect raincoat with a hood!